Originally, only the raccoon had an instrument. Then I realized I had drawn the owl directly over the mouse. 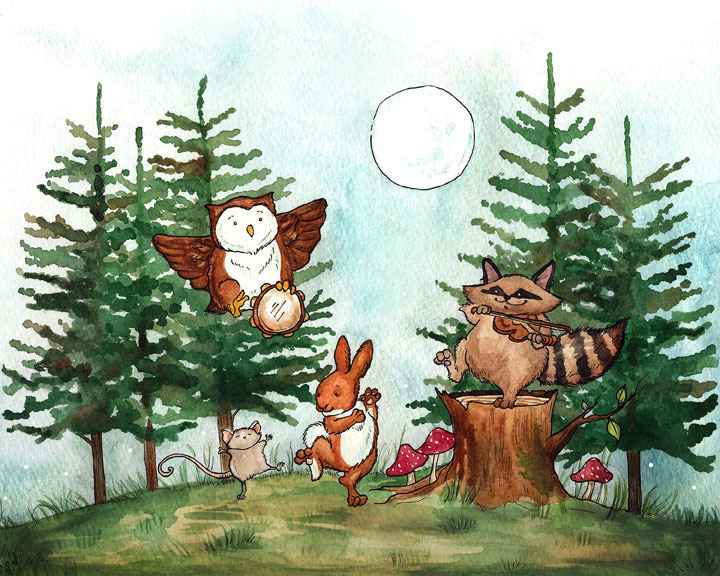 Now, in my happy, whimsical illustration world this owl and mouse are great friends. However, in the real world an owl hovering over a mouse at night is much more sinister, and to my horror the illustration turned into a very different story at a second glance. 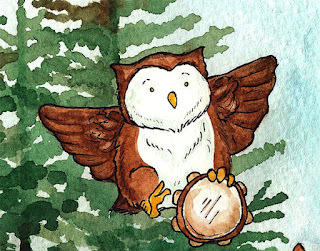 So I gave the owl a tambourine. 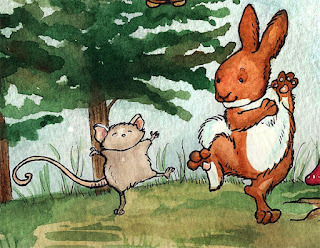 That mouse knows how to get down. 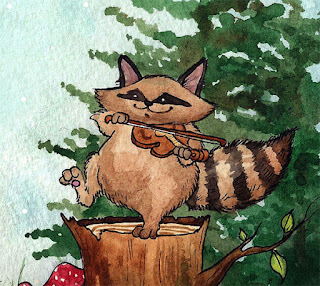 I just listed the print of this illustration in the shop here. Happy Wednesday! NIce!! I love these creatures! Am dropping by for your help, please. Not only are your a follower. but you've been a customer as well, so your input into a possible future project would be invaluable - plus your imagination, too! In 2013, am thinking of using the posts as a basis for kids books. Any views (yours or Ryan's) would be much appreciated. With nearly 200 under my belt, my half-Scottish soul feels I could use them more effectively. What think you? Thanks in advance - want real, pragmatic views, please! Meanwhile, all the best for the upcoming holidays. It's a great idea to use posts as a children's serial or series of books, the only thing that might be tough is driving traffic to the blog, if kids are the intended audience. Unless you're thinking of creating the books separately? I wish I had better advice for that, I have been trying to break into publishing for years myself. If you're thinking of using the blog itself I would say, maybe a separate blog for the kids' books? You certainly have wonderful material with Cy Bear and your other creations! I hope any of that helps, and hope you have a wonderful holiday too! A Giveaway? Yes! And new mailing materials!